Is this what the real Kimye wedding will look like? Tumblr user ultimatekimkardashian.tumblr.com plays out the big day using barbie dolls. 1. 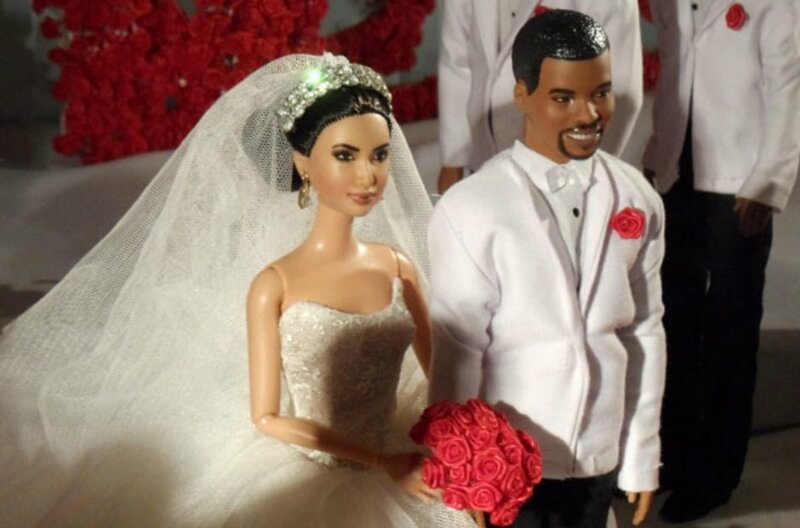 Kanye West And Kim Kardashian's wedding has been played out by barbie lookalikes. 2. Tumblr user ultimatekimkardashian.com has cleverly put these creative images together. 4. Even a scary looking Kris Jenner was on hand to help her daughter get ready. 5. Is this what the moment Kanye West and Kim Kardashian say 'I do' will look like? 6. The barbies share their first kiss. So romantic. 7. Let's not leave any details out, we need to see what their (barbie) cake would look like. 8. And Kanye West and Kim Kardashian lived happily ever after. The End.